As I mentioned on my “Baked Pimento Pepper Halves” post, I made these dumplings using minced chicken and polenta instead of usual matzo meal or bread crumbs. It was an experiment that turned out better than I had expected. It started quite innocently with polenta experiment. I had an e-mail thread going with my favorite nephew Seb about cooking polenta. I wanted to know if it can be cooked in microwave. I took 1/2 cup of chicken stock and nuked it for 45 seconds on 100% power, then mixed in 1/4 cup fine ground corn and cooked another 45 seconds on 75% power, uncovered. And, what do you know; it had a decent texture and tasted cooked, it was actually pretty good even though it was on a dry side. I left it on my kitchen island and started to prepare new chicken-on-skewers recipe from Cooks Illustrated where chicken breast is kept moist by coating it with bacon paste made in mini-chopper. I made the paste with 2 cloves of garlic and then I changed my mind about the skewers, there just wasn’t enough meat for two people. Eureka! Chicken dumplings for a soup! I cut up the breast into small pieces and then minced it in mini chopper together with 1 egg, 1/2 tsp. of salt, 2 Tbs. of chopped garlic chives, 1/2 tsp. marjoram, 1/2 tsp. baking powder and 1/2 tsp. of white pepper. Then I mixed in the polenta, formed it into 1-1/2” balls and slowly simmered in salted water for 15 minutes. They came out nice and fluffy (baking powder J). 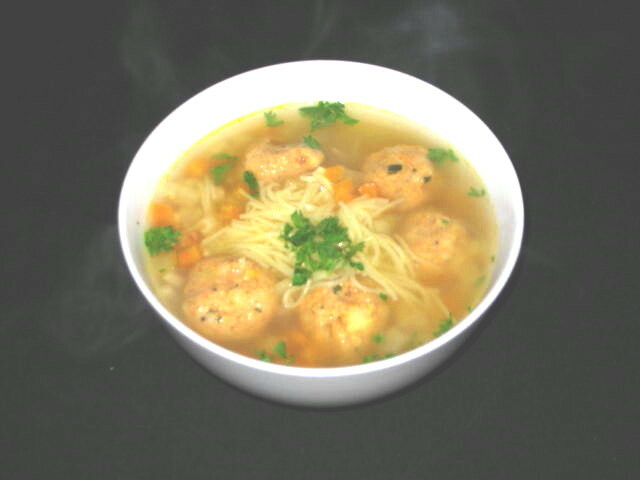 These are now my favorite dumplings for a chicken noodle soup.